Get your daily Tarot reading on-line and free, using one, two or three Tarot cards. For the "daily Tarot card" reading on this website, we use all Tarot cards (each set contains 78 Tarot cards - the Minor Arcana, therefore 56 cards, where instead of the hearts, spades, clubs and diamond suits we employ swords, pentacles, cups and wands, and also the Major Arcana, 22 cards, based on strong symbolic pictures, which together form a coherent story). The Tarot reading of all three cards at the same time will best suggest, whether all three pillars of your soul are in harmony, or where there are hidden risks, and which direction is best to take to feel happy and content at the end of the day. Positive symbols represent talents. Problematic symbols represent trials. The cards will indicate creative options that are waiting for you (think about how you can use your abilities and talents to solve tasks and expected problems) and will point out possible challenges and trials occurring during the day. If you are focused and sense approaching traps as well as opportunities created by the universe, you will find it easier to use your own abilities for intellectual growth and overcoming obstacles. To read three Tarot cards every day can be time-consuming and spiritually challenging, and for some it could be exhausting. It is therefore possible to select only one Tarot card (or two) - according to your willpower and current mood It is up to you, whether you want to work with an overall image of opportunities or whether you only want to focus on one or another area that interests you. Some people suffer from gloomy and nostalgic thoughts, others from critical relationships, unpleasant surroundings, lack of energy, etc. In this case, or if you are a complete beginner in Tarot reading, definitely choose only the card that interests you today. Other card positions don't have to bother you in this case. The Tarot reading doesn't represent any dogma, but is primarily a creative journey, in which you lead a dialogue with your own soul. If possible, we always recommend to use your own pack of Tarot cards. The on-line reading on this website is free, but if you buy your own cards and work with them every day, you will build a close relationship with them (an important bond), which is difficult to substitute for in the world of internet. They will be truly "Your cards" and after months or years of use you will be able to trace the prints of your own life story. These Tarot cards could provide you with even better advice in times of important decisions. Shuffle the cards (for online reading the cards are shuffled by the computer) and concentrate on what you should do to enjoy this day. Ask the Tarot cards for advice or instructions If you are not reading the cards until the evening, then concentrate on the cards telling you what you have learned during that day or what influenced your life in a significant way, even though you maybe didn't consider it important. Energy (soul and space) - the first position signifies the spiritual support that you are getting in order to fully use a certain talent and skills in a creative process or to overcome obstacles. 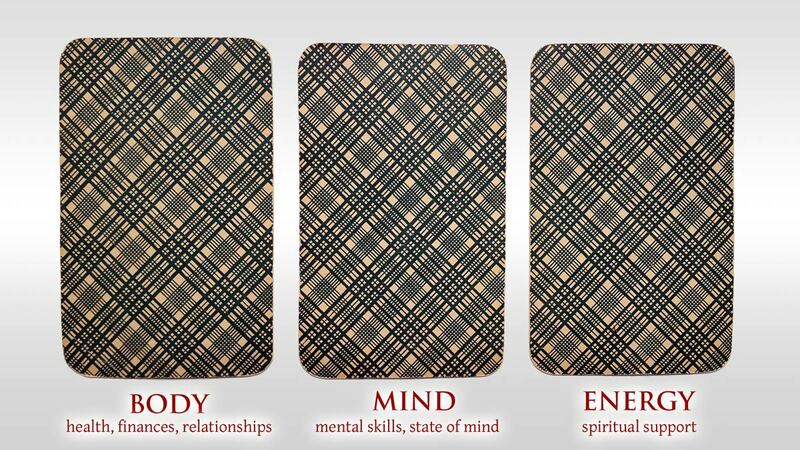 This card position is a place of inner wisdom. Mind - the second position reflects your thinking, mental skills and the state of mind, attitude and opinions. This card position suggests how you are going to deal with making decisions and in what direction your thoughts will go. Body - the third position indicates the development of your actions in the outside world, physical ability, health, finances and relationships. Experiment with the online "daily card" reading as much as you like - even better if you use real cards. Start each day with a free reading. Improve your own creativity and be ready for what is awaiting you.